New York Catholics welcomed the new pope elected Wednesday, expressing happy surprise that a cardinal from Latin America was chosen for the post. Cardinal Edward Egan, archbishop emeritus of New York, said on NBC News moments after the announcement that the Argentine cardinal, Jorge Mario Bergoglio, was "a man of great compassion." "I have immense admiration for him and I think you're going to like him a lot," Egan said. Bergoglio is the first pope from the Americas and the first from outside Europe in more than a millennium. He chose the name Pope Francis. As white smoke rose from the Vatican, declaring the selection of a new pope, crowds of people gathered in St. Patrick's Cathedral to watch the historic announcement. Chris Glorioso reports. WATCH: CARDINAL DOLAN: POPE FRANCIS HAS "WON OUR HEARTS"
Carlos Encinas, who is from Argentina and lives in Queens, said the announcement was a welcome surprise. "I didn't expect that. I'm very happy," Encinas told NBC 4 New York. "I hope that he's going to be a good pope. He's very humble." Gerardo Sportella, another Argentine in Queens, said Bergoglio is "a very good man." "For all the community here in New York City, we are very happy," he said. After announcing "Habemus Papum" — "We have a pope!" — a cardinal standing on the balcony of St. Peter's Basilica on Wednesday revealed the identity of the new pontiff, using his Latin name. Bergoglio had reportedly finished second in the 2005 conclave that produced Benedict XVI — who last month became the first pope to resign since the Middle Ages. 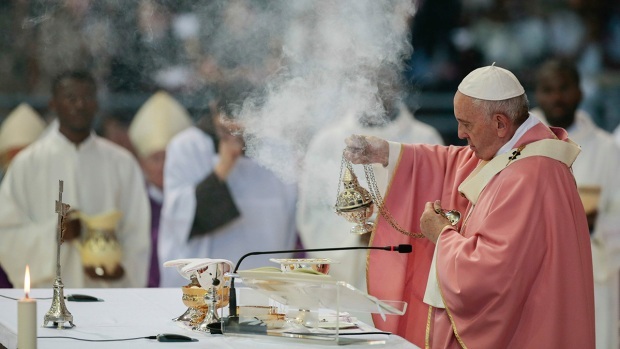 WATCH: WHO IS THE NEW POPE? The 76-year-old archbishop of Buenos Aires has spent nearly his entire career at home in Argentina. "He has been an example to the people of Buenos Aires and all of Argentina," Egan said. Bergoglio is known as a humble man who denied himself the luxuries that previous Buenos Aires cardinals enjoyed, often riding the bus to work and cooking his own meals. He regularly visited the city's slums and considers social outreach, rather than doctrinal battles, to be the essential business of the church. “I’m sure he’s going to bring this with him, his concern for the poor of the world, and that can well be a significant change,” said Father Jack Replogle, a Jesuit priest in Manhattan.